Ink Web Solutions design stunning email templates and landing pages for their campaigns. We help to convert your design files (PSD/AI/EPS etc.) into responsive emails & landing pages that render correctly across all leading email clients and major web browsers. E-mailers are a powerful tool for market promotion and brand awareness. Quality, timely delivery and cost effectiveness are few things we keep in mind, while designing our mailers. Strong email designs keep you in the minds of your top customers and snare new business while keeping your brand strong. 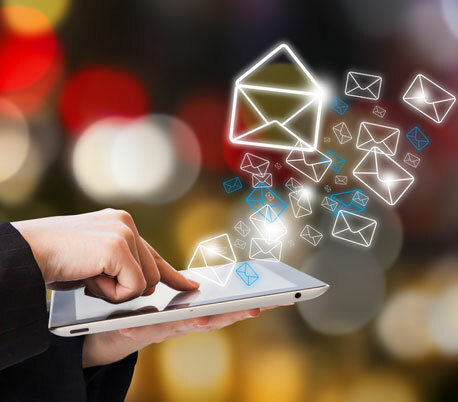 Once your email is in your customer's inbox, it is the email design that holds the attention long enough to convince the recipient to perform a specific action. Mailer design service focuses on designing effective Email Campaign Design that not only reach out to the user, but also catch user's attention. Our Professional mailer design team creates mailer designs and flyers that create impact of brand identity as per your company marketing strategy. Ink Web Solutions creates email designs that give your company the needed edge to have a successful email marketing campaign. Please feel free to view our portfolio of Web designs, Our Clients & Latest Projects. Why use our e mailer service? If you are interested in our concept of developing and designing e-mailer design, our designer can develop and design best graphics and attractive e mailer to promote your business on your approval and on your business requirement basis. Chandigarh's Leading E-mailers Company ! Ink Web Solution provides E-mailers services in Chandigarh, Mohali, Himachal Pradesh and India.